In order to reach this confluence, I set my base camp in San Pedro de Atacama, a small town around 90km east from Calama (1400km north-east from Santiago), II region in Chile. I started a research about how to reach this point around a month earlier. Using Google earth, I found a trail that followed a line of electric towers and that was following the right direction. Finally, I found out that the trail I had found allowed me to reach as close as 5km from the confluence. In summary, I rented a 4x4 vehicle from Euro Rent a Car (In San Pedro) that offered me a very reasonable price considering that they saved me to travel back to Calama (a bigger city) to get it. I found very valuable information also from Javier, an Argentinean guy that settled in San Pedro around 10 years ago. He runs a pub in Tocopilla street between Caracoles and Padre Le Paige (andestraveller@gmail.com). 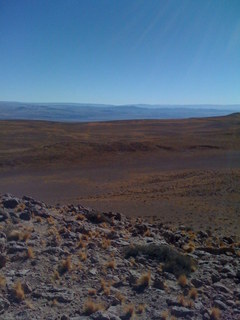 From San Pedro, I drove on the route 23 towards Paso Sico (Argentina) passing through the towns of Toconao and Socaire. The route is paved until Socaire. From there I kept driving for another (around) 37 km on a dirty road until I reached 23°53’46”S 67°49’2.9”W. From that point you could see an electric tower nor further than 20 meters from the road. At this point I left the road and followed the trail that followed the electric towers to the west. The road is in very bad conditions and have some very step sections that will require both a good 4x4 vehicle and some experience driving off road. I followed that trail, that is a rocky and some times sandy trail for around 1hour, having to take some "long way around" detours due to the terrain but always keeping a westerly direction, until reach the point: 23°57’35.4”S 67°59’47.6”W. At this point I left the road and head south on a sandy valley that runs mainly north-south. From here I drove on the sandy valley for another 2km before it become a bit too soft to risk going any further. I left the car at: 23°58’31.2”S 67°59’36.1”W and kept walking on the sandy valley towards a grey peak far in the distance. After an hour or so, I reached almost to the 24°S and from there, I just had to climb a little slope to your left hand side to reach the exact confluence. As an adventure trip, it could not lack of some potentially dangerous situation and, I wanted to mention you here about it: After reaching the confluence and driving back to San Pedro –and after several bumps on that rough terrain- I reached again the point where the trail mets the international route. There, and to my desperation, I saw the fuel gauge dropping to zero. Fortunately, it was just a problem with the gauge but I realized how bad it could have been if the tank was broken and the diesel lost in the middle of nowhere, with no way whatsoever of communication. Driving alone –or on just one vehicle- on such desolate areas is a risk not to be taken lightly. Apart from that, if you have a good vehicle and some 4x4 driving skills, reaching this confluence is an easy task, as you can drive most of the way to it.